In nearly 30 years of ministry to the unreached, AFM has been constantly developing and improving its model of effective cross-cultural church planting. Recently, we developed a new refinement of our model to guide our missionaries through key phases of their ministry. 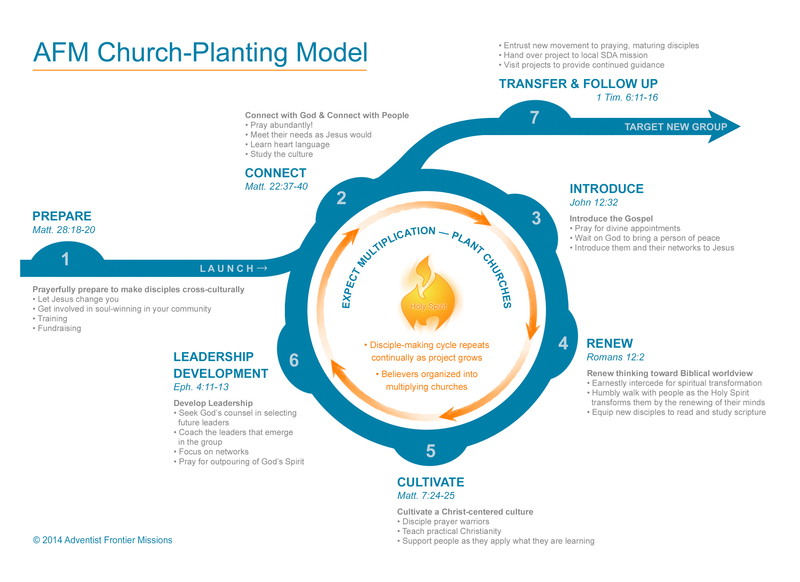 The new AFM Church Planting Model is not intended to be linear. Several aspects contained in the main circle of ministry can be taking place at the same time. When we expect a tornado, we prepare for it. When we expect that a church committed to God will want to multiply, then we should work with God to prepare for that as well. This all starts with fervent and constant prayer each step of the way. And as the disciple-making cycle repeats continually, the project grows as directed by the Holy Spirit. 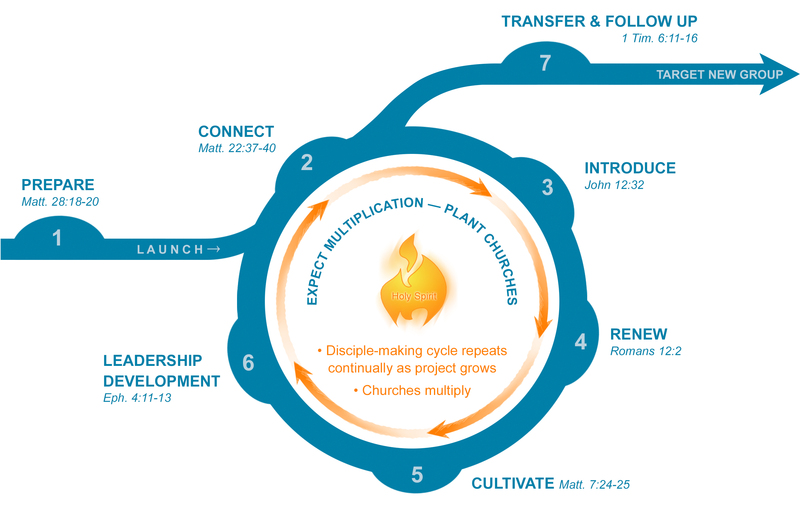 Believers are organized into multiplying churches as they reproduce the cycle with new members. Prayerfully prepare to make disciples cross-culturally. Christ commissions his disciples to become disciple-makers. They were not to rest content with merely following Christ, themselves; they were to assist others in doing the same. Preparation encompasses learning how to be disciples as well as disciple-makers, and then engaging in training and other responsibilities required before launching into ministry in another country. Our modular training allows missionaries as well as non-missionaries to attend portions related to discipleship and church-planting. Connect with God & Connect with People. In following the “love your neighbor” principle recorded in Matthew 22:37-40 Jesus mingled with people and made himself available for friendship as well as ministry. So we make ourselves available. We acquire language of the people and develop friendships. We serve their needs in practical ways.We earnestly pray for those around us and do all we can to realistically represent God’s kingdom. Introduce the Gospel. We depend on God to provide a “son of peace” (see Luke 10:6) – one or more individuals willing to accept us, one who has the influence and the will to provide access to their community. We cooperate with His Spirit as we introduce them to the plan of salvation. We use terms easy to understand, remember, and share with their family and community. We appeal for them to be reconciled to God and support them as they respond. Renew thinking toward a Biblical worldview. Paul associated a transformed life with a renewed mind. As believers learn to think from a biblical perspective, it naturally leads them to live from a biblical perspective as well. Believers are prayerfully guided through the Bible to discover major teachings and how the conflict between Christ and Satan impacts their lives. They learn how to engage in this war on God’s side, and they learn how to study the Bible for themselves and how to find answers, when needed. Cultivate a Christ-centered culture. We disciple prayer warriors while we model and teach practical Christianity. Disciple-making continually brings cultural life before God for transformation. Where doctrines may teach that divorce is wrong, the “cultivate” aspect of discipleship seeks to identify the dysfunctional behaviors that lead to divorce and the attitudes and behaviors that lead to happy marriages. Believers learn how to develop lives that revolve around prayer, worship and ministry. They learn how to resist temptation and avoid activities that bring shame to God. Develop leadership. Our concern here is spiritual maturity more than authority. God needs mature Christians who take their relationship with Him seriously; who model how to apply biblical principles and live Christ-like lives. As the original disciple-makers connect with people, they model how new leaders can do the same. As they present the gospel in user-friendly terms and forms, they encourage and empower emerging leaders to do the same. As believers take interest in spiritual responsibilities, additional training is provided to deal with organizing for outreach and community service. Cooperation is also developed between local leaders and leaders of the church at large. As believers mature and turn into leaders, the original disciple-makers increasingly shift from leaders to coaches, then from coaches to observers and counselors. The project overall is handed over project to local SDA mission, and visitation to the project ensures continued guidance. The missionaries then move on and begin work in a new area.